This interview with the Los Angeles–based artist Ramon Ramirez explores the artist’s views on the meaning of his work, its inspirations, and the role of the urban landscape in cultural production. It was conducted by e-mail during February 2013. JLSG: You have described your work as a way of getting to know yourself through the investigation of urban places, such as your home in Los Angeles, and their collective social spaces. Would you say that your work represents a form of the imaginative critical practice that the cultural theorist Arjun Appadurai has described? RR: Yes. My work has always been about investigating my environment and understanding how it informs me as a person—and, by extension, how it shapes us as a society. I believe there is a back-and-forth dialogue that occurs between the city and its inhabitants. I guess you can say that I see myself as an avatar of sorts. JLSG: Can you say more about this dialogue and your role as an avatar? What has your conversation with your home taught you and what might it say to others? RR: I think it’s important to realize that the creation of a city is a dialogue and not just a top-down directive. Yes, planners and architects implement their visions, but there is also a vernacular aesthetic that occurs. I’m starting to realize that people are shaping the city too. Mural ordinances are being revisited and local artists have been a part of the process; artists are helping spawn new “art districts” all around LA. The city acts as well as reacts; it’s a symbiotic relationship. It’s not so much that I want people to learn; it’s more that I want them to understand. And to be clear, I need to understand. The city is teaching me new aesthetics to which I respond. You see, I believe that art influences music, which in turn influences dance, which in turn influences fashion, and so on . . . but they’re all influenced by the conditions and aesthetics that are generated within the urban fabric. The role of an urban avatar—well, that might seem a little arrogant, but I will tell you that a lot of people are responding well to my urban drawings. I had one client tell me recently that she’s been paying more attention to the physical attributes of her neighborhood because of my drawings. In a way, I’m helping her see. The thing that surprises me most about my work these days is how people respond to it. I draw very personal “monuments” throughout the city, places that I have a connection to. People come up to me all the time and say, “I know exactly where that is.” I’ve also had people give me their interpretations of my work; I may have intended something very different, but their impressions made the painting that much more interesting to me. I recognize the validity of multiple interpretations and actually thrive on that notion. The point is that we have a shared experience. You see, I don’t think my painting is about me. I think it’s about us. Ramon Ramirez is a Los Angeles-based artist with a background in architecture. He received his BA, MA, and MArch degrees from the University of California at Berkeley. 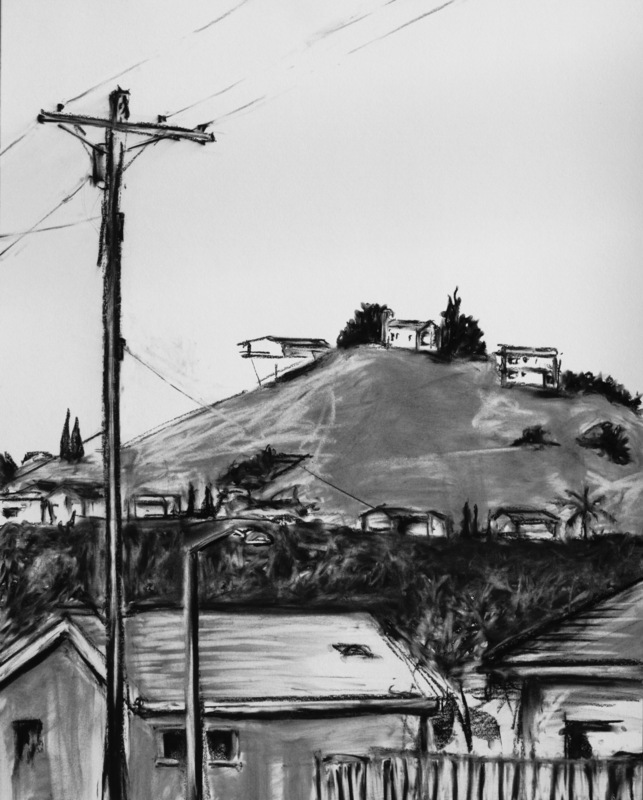 Born and raised in Los Angeles, the city has served as his muse from the onset. José L. S. Gámez is an associate professor of architecture and urban design, a member of the Latin American studies faculty, and the coordinator of the City Building Lab at the University of North Carolina at Charlotte. Fig 1. Ramon Ramirez, I Am the Resurrection, 2011. Charcoal on paper, 25 x 20 inches. Private collection. Fig 2. Ramon Ramirez, Untitled (The Relic), 2007. 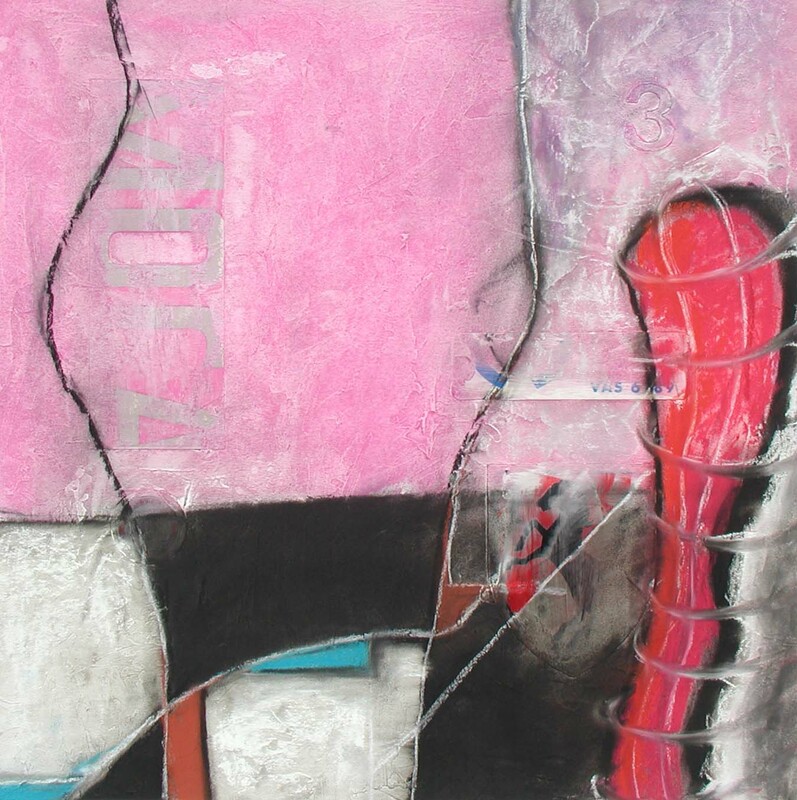 Chalk pastel, charcoal, collage, and Conté crayon on paper, 12 x 12 inches. Durón Family Collection.